1.Automatic adjustment: the fireplace fan can be started automatically, and the speed can be adjusted according to the temperature of the furnace. 2.Low energy consumption: low consumption, high efficiency; increase the room temperature by 41%, save fuel cost up to 16%; no battery or power supply, more environmentally friendly. 3.Attention: The Heat powered stove Fans does not bring direct temperature increase but only a tool to accelerate the heat transfer of the chimney. 2018 Upgrade Technology,faster Speed,larger air volume.The heat powered stove fan is designed to circulate the warm air created by a wood/coal or pellet burning stove operating with normal surface temperatures between 40°C and 370°C. 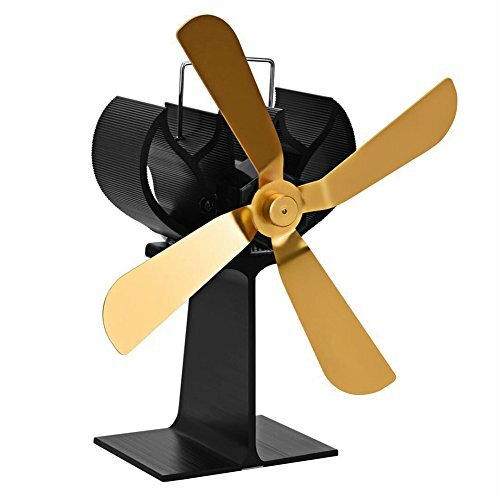 Heat Powered-Our heat powered stove fan is low energy consumption:less consumption and high efficiency,the room temperature can be increased by 41%,fuel costs up to 16%,no battery or power supply required,more environmentally friendly. Heat-driven stove fan, No batteries or main power required:The wood stove fan creates its power by utilizing the heat from your wood-burning stove, fireplace or pellet stove. Circulate warm airflow to the rest of your room efficiently. Save energy and cut fuel bill:Make full use of the heat from your stove and move it to your room. Use less wood BUT enjoy optimum warmth.It also reduces the impact of burning solid fuel on the environment. Eco-friendly wood stove fan. Please Attention:The Heat powered stove Fans does not bring direct temperature increase but only a tool to accelerate the heat transfer of the chimney. View More In Fireplace Fans. If you have any questions about this product by Sundlight, contact us by completing and submitting the form below. If you are looking for a specif part number, please include it with your message.